2Wheel Chick: Surrey by Bicicle ! It didn't get above freezing today. I realised this not just because I had even more layers on today while out on my bike, but also because when I tried to take a swig of water from my bottle nothing happened. Everything was frozen solid - now that doesn't happen every day ! 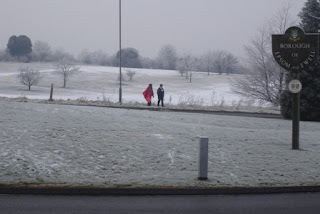 The cold particularly bit on the Banstead Common and Epsom Downs, but it didn't scare the folks away. Lots of people were out walking, horse riding, even sledging. I didn't see any other cyclists though. Where were my kindred spirits hiding? 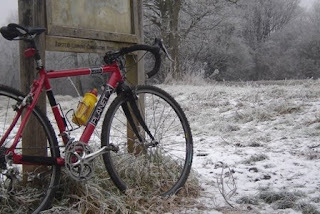 Anyway, my new cyclo cross horse had his first photo shoot today - and didn't the weather look pretty for the occasion ! 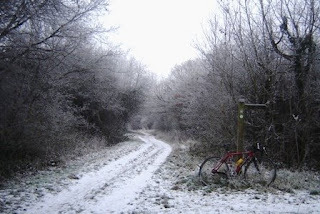 The trails were covered in snow, with icy patches in various places. I had to be careful of the low hanging branches which had icicles hanging from them. It was painful to suddenly get that in your face while speeding along ! Riding through the white stuff was surprisingly easy. I didn't slip at all. The bike just drudged on through the crispy snow. In these conditions, I found it easier to stay on the bigger ring rather than using my usual granny ring though. I may have worked a little harder on the inclines, but things felt more controlled. I could see why people would prefer to be on a fixed or singlespeed bike on a day like this. Maybe that's another bike for me to get one day. In a couple of places, such as Banstead golf course it was obvious that I was the first person venturing there today - no tyre tracks or footprints on the ground at all. I felt a bit naughty spoiling the white carpet. There were beautiful scenes around - all we needed were a few mountains and it could have been Verbier not Banstead ! 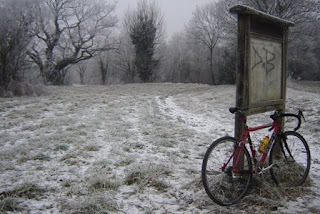 Anyway, I'm glad I made the most of getting out today, one of the coldest days in the London area for several years. Tomorrow we'll back to a "whopping" 8 degrees celsius - get ready to strip off some layers ! I'm an academic physician (formerly at Harvard and Stanford) who found your blog while looking for the best health writers. I think your writing is great! I would like to feature you in the Biking Community on Wellsphere, a top 10 health website that has well over 2 million visitors monthly. Thanks Dr Rutledge, I will check out the Wellsphere site and drop you a line.